What's a presidential candidate to do on the eve of an important birthday? Hold a big fundraiser, of course. Democrat Hillary Rodham Clinton planned to celebrate her 60th birthday at a star-studded gala Thursday night at New York's historic Beacon Theater. Her husband, former President Bill Clinton, was to host the celebration, with comedian Billy Crystal serving as master of ceremonies. Musical guests Elvis Costello and the Wallflowers were set to round out the program. The party was expected to rake in over $1 million for the New York senator's presidential bid. Her birthday is Friday, Oct. 26. It's the second major birthday fundraiser for Clinton's campaign this week. Movie director Rob Reiner threw a party for her at his Los Angeles home Sunday night, with several Hollywood celebrities on hand. The campaign has also used her birthday as an organizing tool, posting a video message on her campaign Web site from former President Clinton urging supporters to send birthday greetings. It's a milestone birthday for the former first lady, who made her debut on the national stage in her husband's 1992 presidential race. Then, the Clintons were portrayed as a youthful power couple who would bring new energy and a generational shift to the White House - a message Democrat Barack Obama has tried to capture this time. 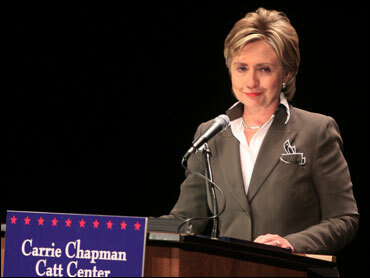 Clinton has joked publicly about her age in several recent campaign appearances.